Record numbers of children are migrating alone right now, according to a new report released by UNICEF today. In fact, the number has increased nearly five-fold since 2010, with at least 300,000 unaccompanied and separated children counted in some 80 countries in the combined years of 2015 and 2016. 200,000 unaccompanied children applied for asylum across around 80 countries in 2015-16. 100,000 unaccompanied children were apprehended at the U.S./Mexico border in 2015-16. 170,000 unaccompanied children applied for asylum in Europe in 2015-16. Unaccompanied and separated children accounted for 92 per cent of all children arriving to Italy by sea in 2016 and in the first months of 2017. 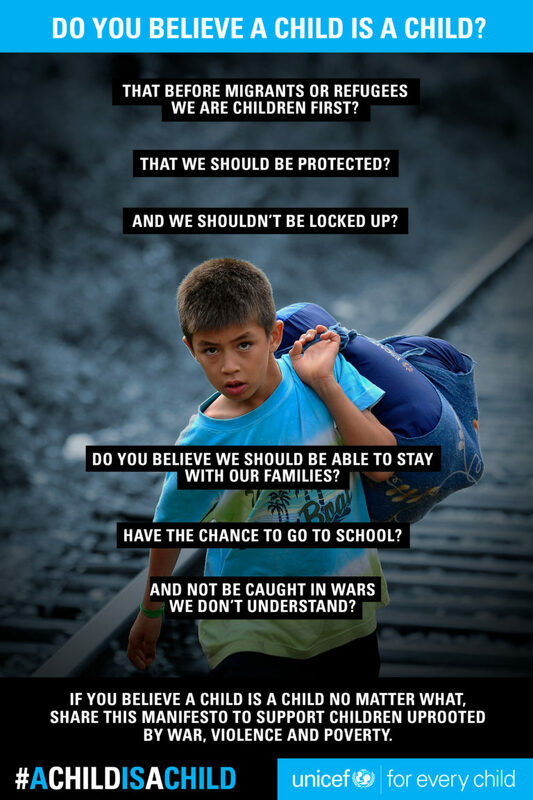 Ahead of the G7 Summit in Italy, and a European Council meeting in June, UNICEF is calling on governments to commit to the points in the manifesto below, produced in the name of protecting children who are refugees or migrants. You can help by sharing the messages we post on social media, and by spreading the word about this action agenda.